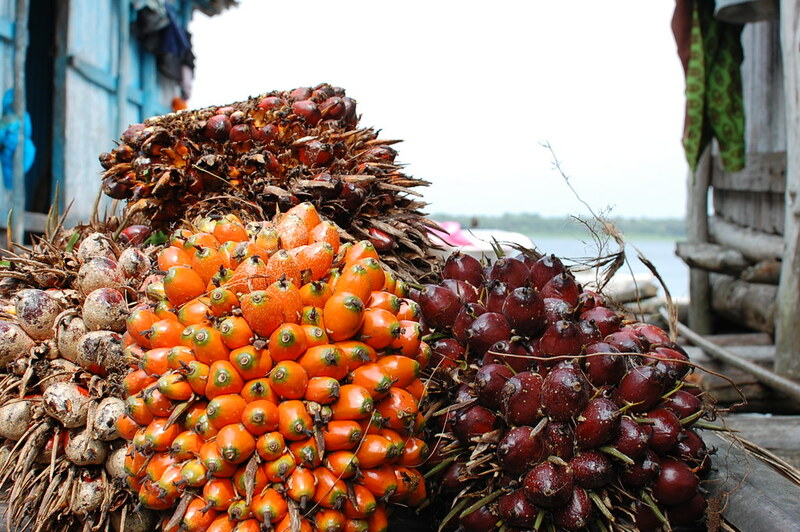 ‘Nigerian Seasonal Produce’ is a monthly column published on the last Saturday of each month to celebrate Nigerian fruits & vegetables, and personal stories. In this column, a writer explores a specific seasonal fruit, vegetable or leafy green assigned by the editors of Kitchen Butterfly and based on the Nigerian Seasonal Produce Calendar. This month of October, we’re celebrating Guavas. 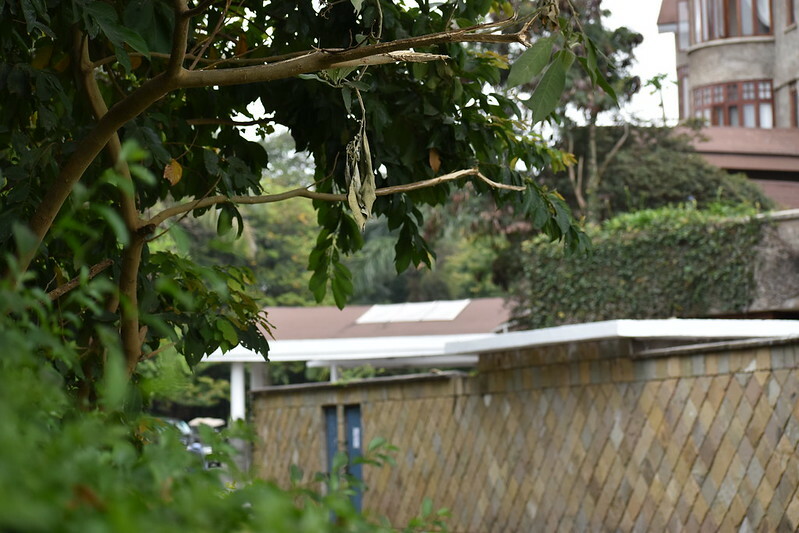 Our author, Kovie writes so beautiful about memories of Big Mummy – her grandmother – and her trees. This piece had me laughing, crying and feeling all shades of lovely for memories at their finest, are a beautiful thing. My grandmother’s compound used to house a mini-orchard. 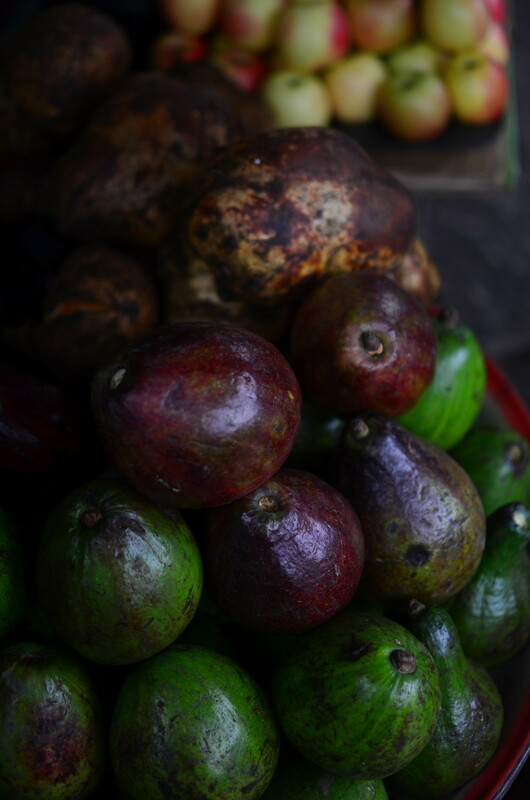 A number of trees were spread around the yard: mangoes, grapefruit, avocados, palm nuts, coconuts, and right by the gate – the first thing you’d see upon driving in – a guava tree, with several large branches and an abundance of green leaves. As a child, I slept through most car rides. At the end of the thirty-minute drive from our house to Big Mummy’s was the sight of the guava leaves as we made a turn into her street. How I managed to always awaken from that deep slumber just as we made the turn will forever be a mystery. I remember fondly how she’d sit on her low stool on the veranda awaiting our arrival, a bowl of fruit – whichever was in season – at her feet. 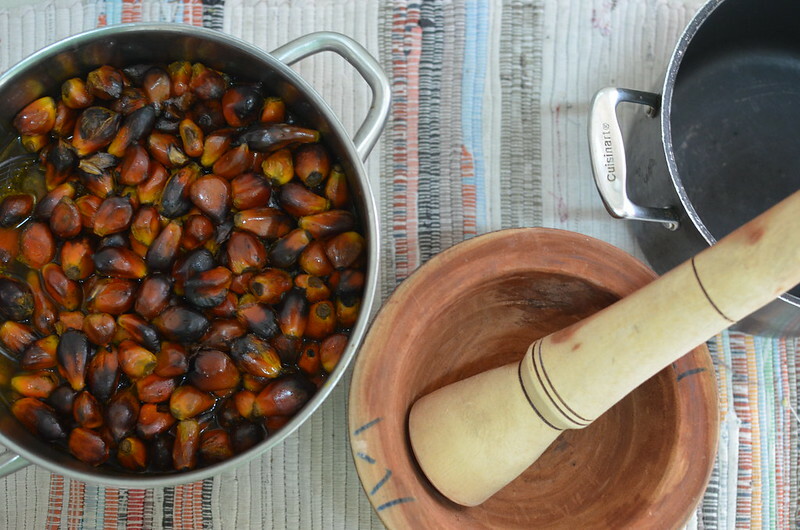 and the palm nuts, well those were for mother’s soup, not snacking. My brother, knee-deep in mischief, would somehow find a way to cheat me out of my share. Still, we would hang out together on the lower branches of the guava tree, away from adult conversations, trying to count the number of guavas on the tree and making a game of guessing correctly which ones were ripe. 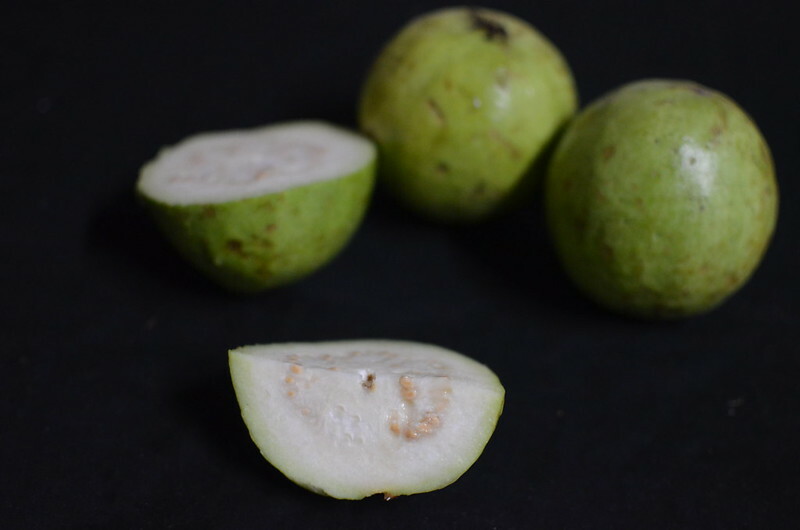 The guavas in my grandmother’s house were never very huge, no bigger than a baby’s balled up fist, but the juiciness of the ripened fruit more than made up for the size. As they matured, the dull green of the skin would brighten into a more yellowish hue, the insides a magnificent shade of pink tottering on the border of red, the seeds marvellously tender – easy to chew and swallow while completely ignoring warnings of rupturing appendixes or guava trees sprouting from human heads in the near future. 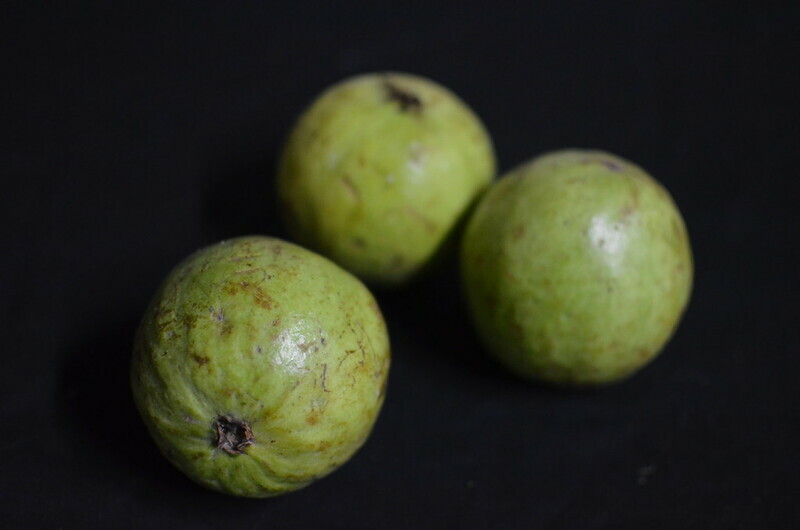 So were the guavas of my childhood. I remember the day we let the tree go. My grandmother, having lost yet another glass louvre to the stones of neighbourhood children trying to get to the fruit, insisted that the trees be cut down. The grapefruit was the first to go. Then the avocado. Still, the children came. “It’s the guavas they are after.” My mother, exasperated by all the windows she’d have to fix, made the arrangements. I sat in the corner watching the man work. As the branches fell, the children would rush in to grab whichever ones had some fruit still attached. In silent protest, I refused to partake in the bounty. 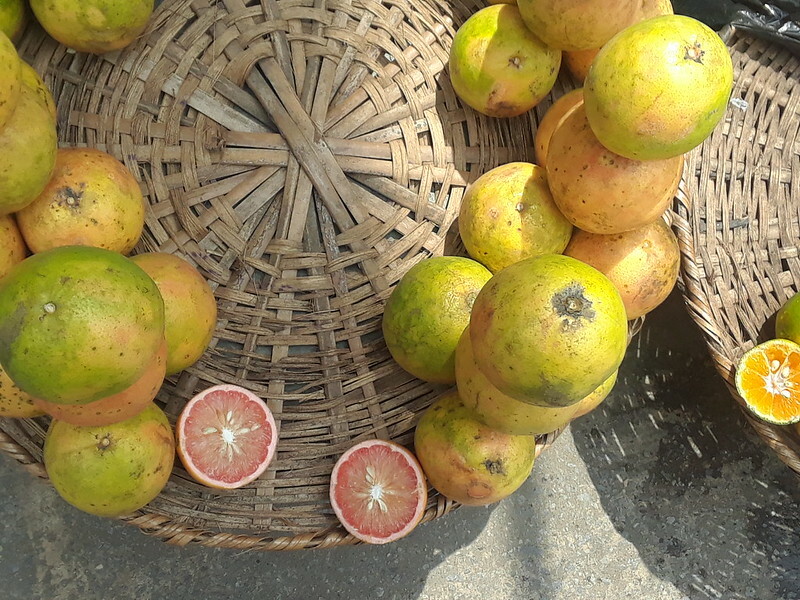 Years later, long after the demise of that tree and my grandmother, my mother called from the market with news of the tray of freshly harvested guavas she’d happened on. “Get some!” I pleaded, excitedly anticipating a rehash of a happy childhood memory. But these were different. The fruit, though ripe, still retained its green. I should have known then not to trust them. Too huge to bite into, we got a knife. The insides were white. These don’t look ripe, I complained. My mother insisted that they were. The seeds were too hard to chew on. I tried a few bites before giving up, the taste of disappointment heavy on my tongue. I’m munching on a guava as I write this. Not the guavas of my grandmother’s house, the other kind. I find that I don’t hate it this time. It’s better now that I simply think of it as a new fruit, a different fruit. 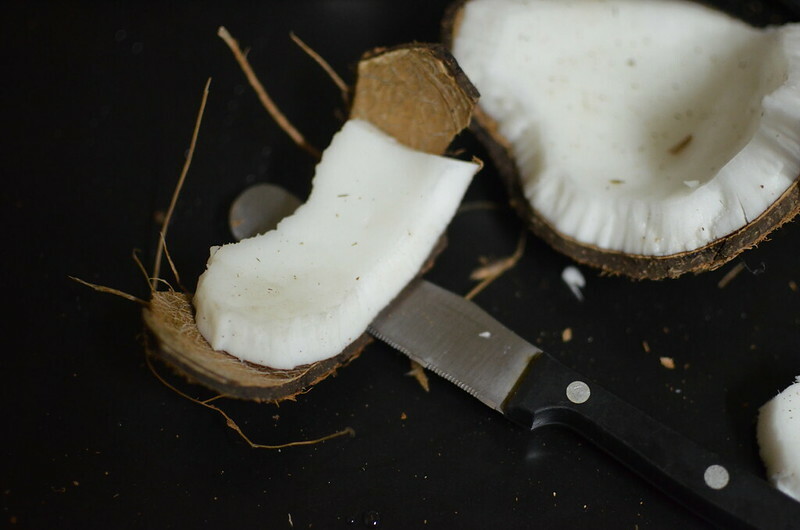 One that I could eventually come to love; with its pale green skin, slightly crunchy exterior – reminiscent of a pear – and subtle tropical taste. I call my mother, who now lives in my grandmother’s house, to reminisce. We talk about how long it’s been since Big Mummy’s passing. We talk about the trees we miss. We talk about the cost of avocados and how we took them for granted when we had them. We talk about her new plants. I bring up the guavas again. “How come we never find the type of guavas Big Mummy used to have?” I say. She responds with the same words my grandmother would have used, in almost the exact tone, “They don’t make them like they used to anymore.” We both laugh at her near perfect imitation. “Big Mummy”, she sighs, as her laughter segues into that space of loss, remembrance, and longing, “I miss her”. Me too, every day. I spit out the seeds. Kovie. Independent curator. Occasional writer. Experimental foodie. Closet music-maker. Part-time creator. And full-time dreamer. Purposefully working towards ending each day with a perfectly brewed cuppa, a forehead kiss, and a song on my lips. Because that, I daresay, is perfection.